For children turning 4 or 5 in that year. A protective wing is placed around the little ones as they enter this new world away from their home. 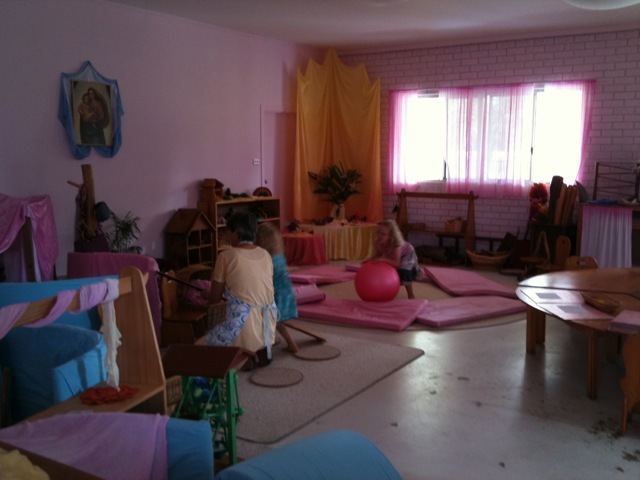 The family-like atmosphere created provides warmth and time for individual and group expression and an appreciation for the wonderful world of nature surrounding is fostered when, by joining in healthy domestic activities, the children develop a real sense of belonging to and caring for their environment. At Preschool we strive to develop sensitivity for the ‘unfolding’ qualities of each individual entrusted to us. As in the Kindergarten many artistic experiences are offered: story telling, painting, drawing, singing, drama and cooking. But the specific aim of Preschool is to provide an all-embracing family-like environment, to make the bridge between home and school life a secure and happy one. We welcome you and your little ones and look forward to spending many happy days together! All year long, we have many lovely things planned for the children, including the seasonal festivals, which we will also share with you. Meanwhile, there are a few ways you can help us all year round to make our day’s routine run smoothly. Morning tea: Consists of plates of shared fruit and sometimes a meal we have prepared together with the children that morning, eg bread, porridge, rice etc. Please bring a piece of fruit to share. Lunch: Please provide your child with a healthy lunch: no lollies, cordials, chips, processed or packaged foods (eg. Rollups or muesli bars). Drinks: We have filtered water for the children to drink and this is offered at various times through the day. Spare clothes: A set of spare clothes, kept in a plastic bag in your child’s bag, is essential. In hot weather add swimmers, and a towel; in cold weather warm socks and pants; in rainy weather a raincoat and gumboots. Indoor slippers: If it is inside time we take off our outside shoes and put on our indoor slippers. Soft-soled slippers are ideal and there is a mother at School who hand-makes colourful indoor slippers so, if you are interested, please note that orders will be taken at Preschool in first term. Toys: We would prefer children not to bring toys to Preschool. These can interfere with creative play and are often a source of upset in the group. Rather, encourage them to bring something for Mother Nature’s Table. Open communication between Parents and Teachers is a vital part of your child’s experience at Preschool. If you have any questions please do not hesitate to see us. Please be punctual when dropping off and collecting your child. It is important that children do not arrive before 9am as the teachers use this time for the day’s preparation. However, if you do find yourself arriving early we ask that you take time to explore our playground and garden with your child or offer assistance as may be required. We ask that parents are punctual when arriving in the afternoon as well; being late can be very upsetting for your child. When collecting and delivering your child please make contact with a teacher… a simple hello or goodbye. If there are any changes to the collection arrangements for your child, please let the teacher know beforehand. Bus travel for Pre-school children is not allowed, this is a Department of Transport regulation. We are always open to family members sharing their skills at Preschool. Your child’s teacher can let you know how you can be involved.